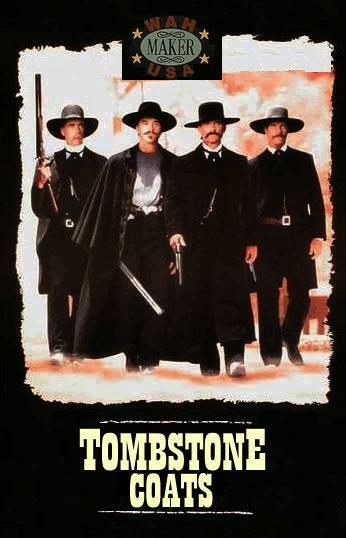 TOMBSTONE. They are the coat Kurt Russell wore as Wyatt Earp. Made of 100% Poly-Viscose (a polyester-synthetic blend). Comes in Black and sizes 32 - 56. TOMBSTONE. 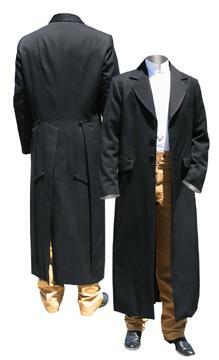 They are the coat Sam Elliott wore as Virgil Earp. Made of 16% Wool and 84% Polyester. Comes in Black only and sizes 32 - 62. "Sorry, these items cannot be shipped to P.O. Boxes"